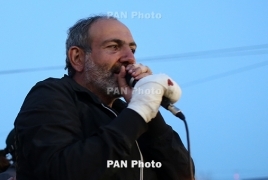 PanARMENIAN.Net - Following a 'velvet revolution' in Armenia, it’s more important than ever for the United States and the international community to get behind Armenian Prime Minister Nikol Pashinyan, Alex T. Johnson, the senior policy advisor for Europe and Eurasia at the Open Society Foundations, said in a fresh article, published by The Hill. Pashinyan was elected Armenia’s new Prime Ministers following months of protests and a civil disobedience campaign, which forced former PM Serzh Sargsyan to resign. "The moment may be fleeting, but for now he has a mandate for change. A government program adopted on June 7, developed in close consultation with leaders of the protest movement, needs and deserves support from the international community. The U.S. government and others should help Pashinyan’s government implement his new program, stamp out corruption, and prevent former government officials from destabilizing the new government," Johnson says. "There are signs that the United States is paying attention." According to the expert, the United States needs to step in to prevent Russia from mucking about with this nascent democratic movement. Armenia, Johnson says, should be an important focus for the Trump administration because it has long been a client state of Russia’s and dominated by autocrats and elites who plundered the country’s resources and preyed on its citizens. "Getting involved sooner rather than later would offer Armenia a chance to shore up its government and improve its economy, which is what many of its neighbors—notably, Ukraine and Georgia—failed to do following their color revolutions," the article says. "The question now is whether U.S. policymakers and the international community stand for Armenia’s future. I hope they do."